Elaborate old world designs receive a glam update with this cocktail table. Elegant cabriole legs are adorned with acanthus and shell carvings to highlight traditional detail. A marble top in a grey tone brings a luxurious touch, and complements the table's silver finish with gold undertones. The Fiorella Cocktail Table with Marble Top by Homelegance at Gallery Furniture in the Oregon, Portland, Clackamas, Washington, Beaverton, Northwest, Vancouver area. Product availability may vary. Contact us for the most current availability on this product. Embrace old world European style with the stunning Fiorella collection. The collection includes accent tables and seating options to help you create the formal living room of your dreams. 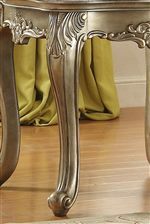 Elegant details like shell and acanthus leaf carvings adorn the collection's cabriole legs, finished in an eye-catching silver color with gold undertones for a touch of modern glam. Marble table tops create an opulent aesthetic, while faux satin fabrics look expensive and add dimension to jewel-tufted seat backs. Modeled after traditional European designs, this elaborate collection brings a sense of drama to any home. The Fiorella collection is a great option if you are looking for Traditional furniture in the Oregon, Portland, Clackamas, Washington, Beaverton, Northwest, Vancouver area. Browse other items in the Fiorella collection from Gallery Furniture in the Oregon, Portland, Clackamas, Washington, Beaverton, Northwest, Vancouver area.